I have some really exciting news! Well, exciting for me, anyway. I finally have the cover art done for my novel, Blue Sky Days! I’ll be doing a reveal here tomorrow, and hopefully I’ll have a GoodReads author page to go along with it! Please check back if you’re interested in seeing the cover and learning more about the book! ‘Real’ books vs electronic books – why does it have to be either/or? I really want to thank everyone who took the time to read and comment on this post yesterday. Writing is what I love best, but I haven’t done much actual writing on this blog other than reviews, and I thought it was time to change that. I’m so pleased with the response, and to know that more and more people are supporting indie writers – there are some really great ones out there! Thanks so much guys, and you can expect more writing from me here on the blog in the coming weeks! Also, don't forget about my 200 follower giveaway! The large button above this post takes you to the post with the official entry rules and form. Follow Friday Fun Week 12 - this weekly meme is hosted by Parajunkee and Alison Can Read. Check out their blogs for details/rules, and to join! Also, be sure to check out this week's featured bloggers on each of the girls' sites! This week's question: Have you ever wanted a villain to win at the end of a story? If so, which one?? Not that I can think of…I’m pretty much a *pro good guys and happy endings* kind of girl. I like to believe that good will always win out over evil in books, because unfortunately, it's not always the case in real life. TGIF at GReads Week 8: TGIF is hosted by Ginger at GReads - be sure to check out her blog and join in the fun! This week's question: Books to Television: Which books would you love to see made in to a TV series or movie? The one that comes to mind right away is the Passport to Peril series by Maddy Hunter. I love those books so much, and I just think it'd be hilarious to watch Emily, Nana and the gang in action. Other than that, a lot of the books I've been reading lately would make great movies: Paranormalcy, the Iron Fey series, Wondrous Strange...there's just so many. 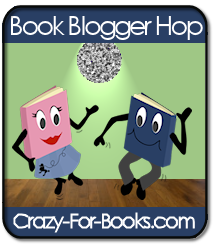 Book Blogger Hop Week 11 - This is a weekly meme hosted by Crazy For Books. Be sure to stop by her blog to check it out. This week's post is here. This week's question: Many of us primarily read one genre of books, with others sprinkled in. If authors stopped writing that genre, what genre would you start reading? Or would you give up reading completely if you couldn’t read that genre anymore? I think that’s one of the problems with people only reading one genre. Of course, if that's what floats your boat, power to you and do what makes you happy. Personally, I have really eclectic tastes and read just about anything, so if an author switched genres, chances are, I’d make the switch with them and continue reading their books, and even if there were no more of a certain book, ever, I'd just move onto a different genre. Happy Friday, guys! Again, be sure to check out my 200 follower giveaway, and please check back tomorrow for the big cover reveal of my book! I'm so grateful to all of you who take time to visit and leave a comment, and I'll be sure to visit you back as soon as I can. Have a great weekend! Looking forward to seeing your cover art - congrats!! Congrats on having your cover art! Congrats on the cover art! You must be so excited!